In today’s construction world, tight schedules are at the order of the day and speed and efficiency can mean the difference between an impressed or unhappy client. Known for its revolutionary, cost-effective, high-pressure, airless spray-painting application for acoustic ceilings, Ceilspray also gives project teams the competitive edge when it comes to roof painting. Ceilspray originally invented the suspended ceiling renovation system in South Africa in 2001 and founder Nico van der Merwe points out that it has been refined to a superior product over the last 16 years, “something a few others tried to match, but could not yet quite succeed”. The problem: A roof that needs painting – quick! Whether it is a new roof that needs a quick finish or an existing roof requiring a colour change or fresh coat as part of a refurbishment, Ceilspray’s spray system is an efficient way of getting a professional result in a short time. “Not only do you get an even spread and better covering with our spray process, but it also saves time – an important consideration for project teams that work according to strict timelines,” says Van der Merwe. Before: an old, stained roof. After: the roof looks as good as new. Van der Merwe points out that Ceilspray’s team can follow any specification and is flexible in terms of working hours to ensure that deadlines are met. Having specialised in the cleaning and spraying of ceilings and roofs since 2001, the team are experts in this field. “Spray-painting roofs is one of our specialities. Over the years, as competitors entered the market with similar products, we kept evolving to expand our services to our clients and build our expertise,” he states. • The assessment of damaged roofs for budget purposes. 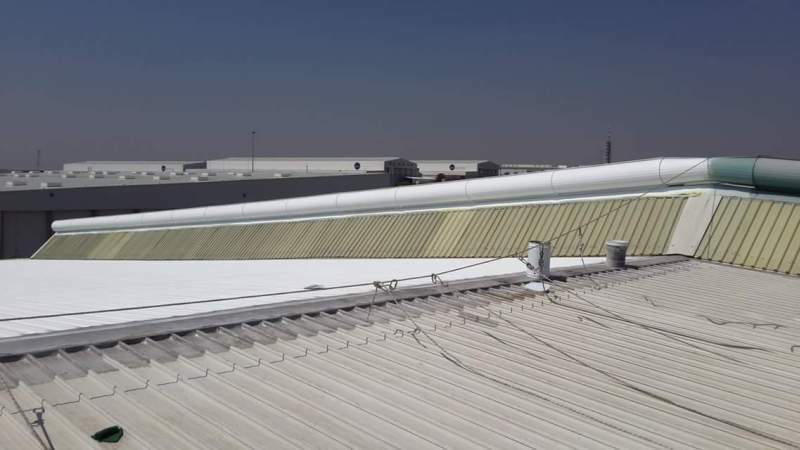 • Spraying of any normal roof paint as well as thermal roof coatings. For more information or advice, contact Ceilspray.